Stay healthy the all-natural way! Staying healthy is crucial to your fitness progress. Whether you’re doing Slim in 6®, Power 90®, or any other exercise program, it’s vital to maintain good health so you can give your best efforts on a consistent basis. 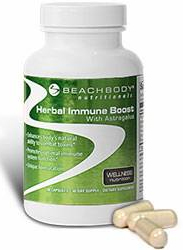 Beachbody’s unique proprietary formula contains some of the most effective natural ingredients for boosting the immune system. In particular, the Chinese herb astragalus has been used for centuries to strengthen the body’s immune system. And, as with all our supplements, you can be sure it’s been thoroughly tested and exceeds the most stringent standards for safety and potency.